Guys are being celebrated big time today in several countries, so Happy Father's Day to all of you and God bless you for all you do! The Mister and I are celebrating today with our son and his sons, and of course, our DDIL, so I will be quick, although my card making wasn't that quick. I started off trying to combine a "splash" challenge with a "kids" challenge only I watercolored my kid card forgetting that it wasn't on watercolor paper so the next thing I knew my kid looked 7D as she rippled and warped unpleasantly. We'll start with one of Hammy's little playmates, a NBUS tweety bird from the Paper Smooches set, "My Peeps." Tweety is having a fun ol' time hopping up and down in the water in the gutter in the street in the neighborhood in the tow ... oh, sorry, I got stuck there for a second. The splash is a PSX stamp (E-1567) and the arched sediment is from SU. QACAS! Of course, I had to wink it and give it googly eyes! 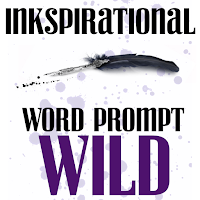 Inkspirational Challenge: Word prompt: WILD. For my card base I laid down strips of rain-droppish Washi tape as shown, covered the raggedy bits with a double horizontal strip of two gray patterned Washi tapes, and bottomed it off with a pretty dotted Swiss to complete the dotty theme. The sediment is from Penny Black. After assemblage, everything was winked and properly beaded. 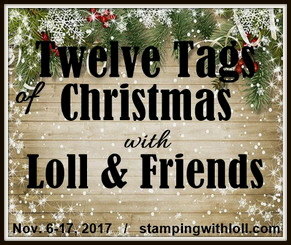 STAMPlorations: June challenge: Stamps & Washi. You can find all the challenge information by clicking the links. I hope you can join in the fun! As always, thank you for coming by to visit the Playhouse and special thanks to you if you take the time to join as a follower! Please let me know you came by, so I can return the flavor! Love both your splash cards! Love the splashes they do look so good. your designing sure is brill. Looovly sparkly cards, love a good splash. Wish I had seen your 7D girl!!! Both cards are so adorable!! Lovely cards Darnell and the first one cracks me up with those amazing googly eyes! Have a great celebration with the family. Terrific cards, Darnell. They are both so fun and whimsical. That first one looks to be a bit of a rascal there! You are able to get quite the sparkle out of your WOS brush. :) Have a lovely day celebrating with your family. Aw how kewl are they, Darnell,??? Mm, think like first one best, but second one reminds me of a big footed bunny image I used to get the kids to colour when teaching little ones way back when!! Cute! BOTH are delightful and fun - and cute too! Love the first one and wish I was in the gutter having fun with him splashing away. Hope y'all have a wonderful Father's Day and just a beautiful day all the way around. I love the bird splashing in the water! And that cute little bunn...You are always so very clever! Have a great day with your "boys"...! Aaaaaw, so adorable...both sparkly and embellished critters. Hope you both have a truly special day with your family. Both cards are great. I love the first one because it is mostly white. I always think of making a card like this and then I can't stop covering the white. I think the 2nd card is so cute and sweet. love the sparkle as always. These are both such cute and fun cards!! Thanks so much for playing along with us at the Color Throwdown this week! What cute cards! Love the critters, the colors and the polaroid die cut. Fun! Have a wonderful time with your family! 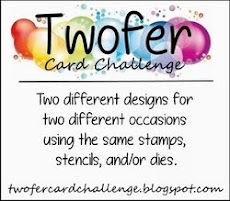 Both are fabulously fun cards, and I do think of splashing around when I look at them. Wishing you a fabulous day with your family. 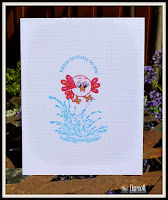 Your cards are just so adorable, I love that sweet little birthday bird splashing in the water, so fun. Such darling cards. Love the cute images. Two cute and whimsical kid-type cards. Enjoy the days with all your boys. Such cute card designs. I love the splashing in the rain one. I used to do that myself as a kid and believe me that was a long, long time ago. I bet it is still a fun thing. Both of these are adorable, Darnell! I think either or both would be perfect for a kid! Who better to understand the fun of jumping in a puddle? Hope you enjoy your day with all the men and your DDIL. Happy FD to Kevin! These are just stunning, love both of them, fabulous fun images. Love these splashing critters, Darnell! Both cards are so fun and cheeky - just like their creator :) I hope you had a wonderful day with your family! 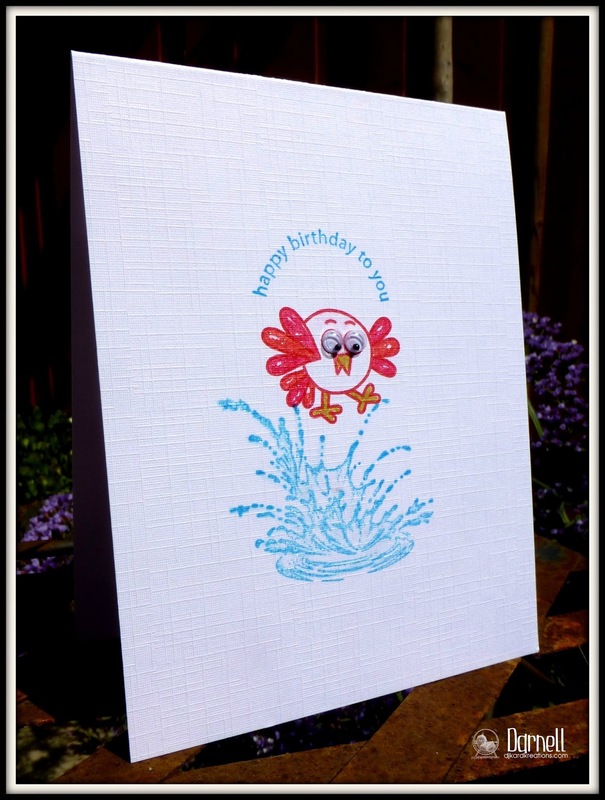 Adorable splashing cards! Love those googly eyes. Adorable splash cards :) thank you for sharing with ATCAS ! You 2 girls enjoy your day with all the menfolk! As you must know by now, I'm not much on cute, but how I love these cards, Darnell! 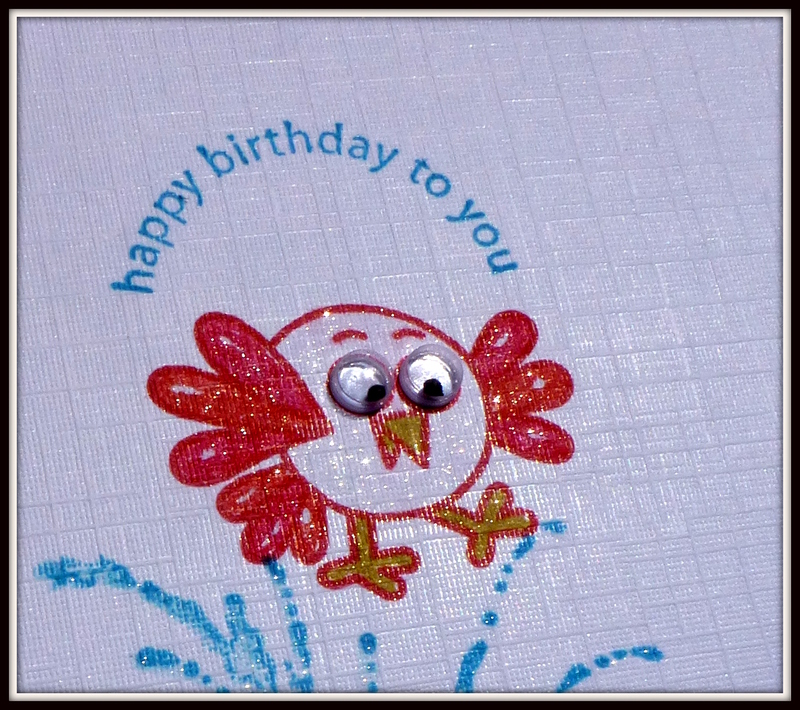 The googly eyes on that adorable birdie--a perfect card! The second one is Washi?! 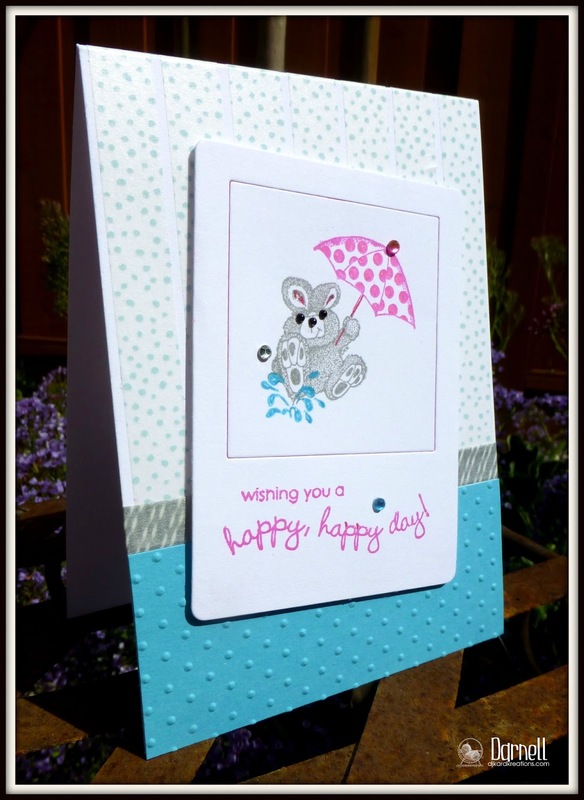 LOVE the look of that card & the embossed dots put it over the top! What fun cards. I love the googly eyes on the first one. Your cards are ohh sooo cute!! I love those little googly eyes on your first card!! stinkin cute!! 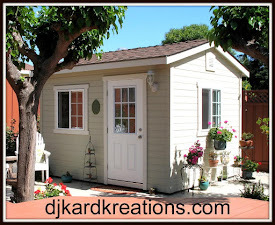 I want to thank you for your beyond kind comments on my blog!! Your comments always make me smile!! Both of those images are too stinkin cute. I love the sparkle, especially on the bunny. And you can never go wrong with googly eyes. Cool idea of using the washi tape to create a background. I hope Mister had a good Father's Day. As always, I leave here with a big smile. Tonight is no exception. Both these are darling as can be. The googly eyes on the splasher was a brilliant addition. Gotta love those PSX stamps. Love the design on #2 and clever use of the washi tape as stripes of rain on this lil' critter. You are so smart to be making 2 cards....what a stash you must have built up. Hope all is well. TFS & Big hugs..Hey to Hammie. Cute little critter cards today Darnell!! I've made that watercolor mistake too, not pretty!! These are so sweet Darnell - absolutely LOVE the first one. It's just gorgeous...that stamped splash is wonderful! Two great cards Darnell - do you ever make a bad 'un though?! 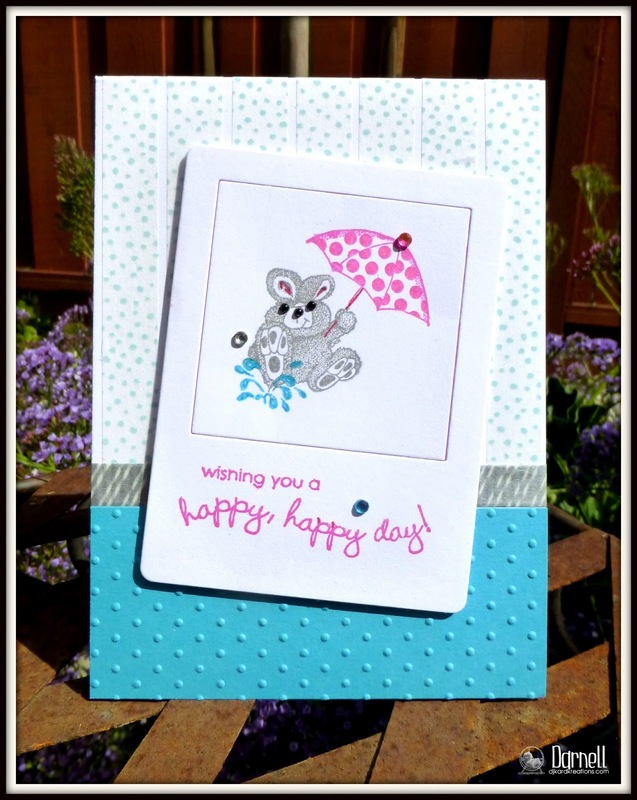 Love how you used the washi tape for the background on your snippets card - clever! Sweet little images on both cards Darnell - love the splash stamp (don't kids just LOVE to jump in puddles) and the google eyes! Two gorgeous cutie pies Dippy - love your first chickadee with the googly eyes but they are both fab. Aren't you lucky to have two examples of splish splash!!!! I'm just going on a hunt to see what I've got! fun cards and sweet images!! thxs for joining us at CTD!! I love your splash cards and boy oh boy did you ever capture the shimmer in your beautiful photos! Hope you all had a wonderful day! 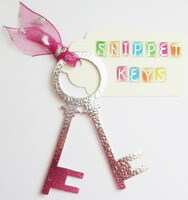 These are super splashy cute! 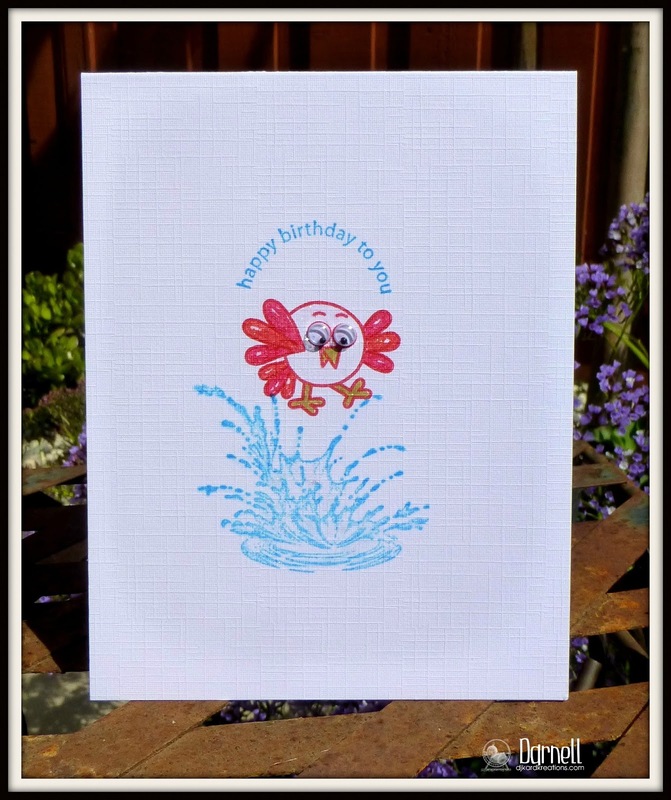 Love these two cards Darnell, the birdy splashing in the water is brilliant! Wonderful, fun cards! Love the splash stamp and all the twinkle and shine you added. That is one WILD bird - love it! Also love the sweet bunny and the splashes of water! Lovely cards Darnell! Love that you added googly eyes to your bird! 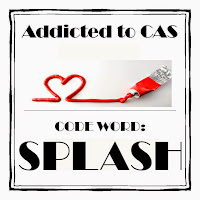 Thanks for joning us over at Addicted to CAS! These two cards are FANGdangTASTIC!!!!! I love them both. I don't know that I've ever used watercolor paper on a card before. I probably should try it out, but going 7D is always good for mixed media. That's why I'm always SOO amazed by you CAS designers who can line things up exactly right (like that awesome background in your 2nd card) or make a card that has a lot of white space without getting it all smudgy with inky fingerprints on accident. These cards are definitely both adorable and GOOGLY EYES!!! You can't go wrong with googly eyes. Thank you for joining us over at STAMPlorations, too! Darnell, these are just too adorable. This tweety bird card is the cutest. Those eyes cracked me up. The bunny is adorable and I love the raindrops. I've been a little scarce buy I'm trying to catch up. I have to tell you the dog cartoon from last week made me laugh out loud. That was the best one I've seen in a long time. Cute cards! You gotta love googly eyes.... they are so fun! Your critter cards are just too cute! Bound to make the recipient break out a big ole smile! Two very cute cards! 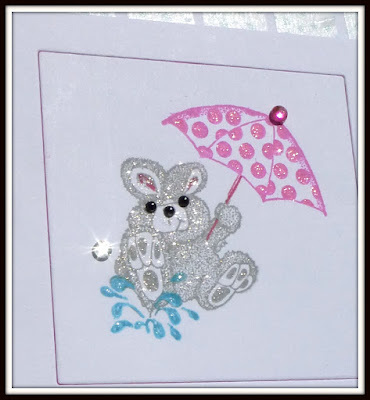 I love all the glitter and your use of washi in your card for our challenge. Thanks for joining us at STAMPlorations! As always very creative and beautiful cards! I love that splash/paddle! Googly eyes were a great touch! What little cuties!! That splash stamp for your first card is brilliant, it has so much detail and Tweety looks like he's having a blast. 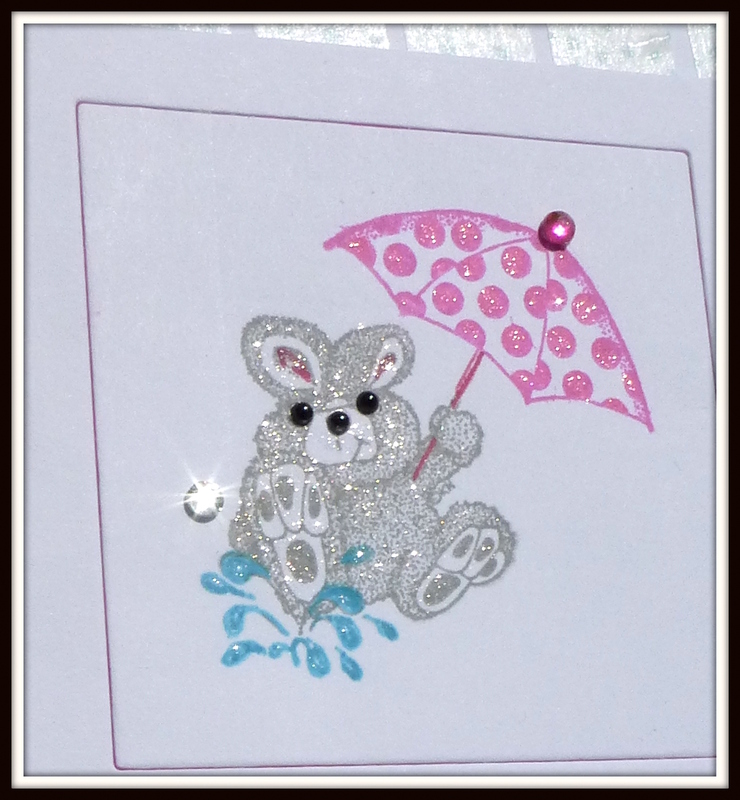 Love the colours of your second card too and love that the bunny is all sparkly. I always loved jumping in the puddles with the kids when they were younger. We've hardly had any rain this year to go puddle jumping yet, its more like 'frost' jumping at the moment. No where near as much fun!! All the things I love on this card are mentioned several times above. Both of these are sooooo cute, Darnell!!! Love the eyes!!!! Both cards are adorable. Love the cute image and the use of washi. Thank you for sharing at STAMPlorations. Cute and very fun cards!! Each one with a very unique style and flavor -they both delight me!! Have a wonderful day! !